Automobile Loans with competitive interest rates, Flexible repayment terms, Low monthly payments, and Same-day credit decisions. Apply Now Contact Us Today! Marine & Recreational Loans with competitive interest rates, Flexible repayment terms, Low monthly payments, and Same-day credit decisions. Online Account Access: Access your account balance, payment history, rewards program, etc. using this link. Like to be rewarded? 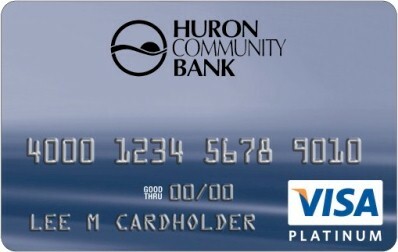 Use Huron Community Bank's Visa Platinum consumer credit card and earn one point for every net dollar you spend! You can redeem points for merchandise, rental cars, cruises and airline travel. Airline tickets are good on any airline with no blackout dates. *Travel Accident Insurance - Coverage applies when the entire cost of the fare(less redeemable certificates, vouchers, or coupons) has been charged to the card. Your account must be in good standing. Restrictions to coverage may apply.